You describe Leo dealing with the Bulgarians through what is essentially the epitome of the Byzantine diplomatic approach of getting others to do their fighting for them. That got me to thinking about something I am curious as to your thoughts upon. By the Byzantine era, the Roman empire was far, far weaker than it had been during the high empire or even the late empire. In contrast to the old Roman stereotype of divide and conquer, or divide and inflict severe harm via punitive expeditions against those tribes that dare to raid the empire, the Byzantine approach was much more subtle and sophisticated. Clearly this was an absolute necessity if the empire was to survive. What I wonder, though, is to what degree the change over to Christianity affected this. I don’t mean by changes in morality or ethics or anything. Rather, a hallmark of Christianity was constant scholarly debate and sophisticated argument over obscure and subtle theological disputes that everyone took very seriously, because clearly right belief was critical to staying right with God. That sophistication of thought then seemed to spread through the whole of the thinking of the Byzantine elite. So to what extent did subtle, sophisticated religious thinking preadapt, in a sense, the Byzantine elite for subtle, sophisticated diplomacy? Ignoring any role for Christianity in the fall of the Western Empire, would the East have survived as long as it did had it stayed pagan, and not seen its intellectual culture become as subtle as it did? Just wondering. Question: Do any prices exist for the 9th Century? Like what would a Solidus/Nomismata purchase? Also do we also have any examples of daily wages for this time period as well? Another very good episode, I always look forward to hearing your podcast. I know you are looking for questions for the end of century episode. Mine is what if any where the trading links between the Byzantine empire and China and what knowledge did the Byzantines have of the extent of the Chinese empire. Last century in episode 92 I said: “As a result of all this I think it’s safe to say that the Byzantines knew almost nothing of China. They knew it existed but I don’t think they’d have had the slightest idea of what it was really like or who was ruling. Certainly there was no formal contact and probably at the other end the Chinese and Indians had little knowledge of the actual life of Constantinople. Nothing much has changed this century as far as I know. I wish those monks who went to China for the silkworms had left us a travelogue. How amazing would that be? https://en.wikipedia.org/wiki/Daqin and http://sourcebooks.fordham.edu/halsall/eastasia/romchin1.asp gives some references. Another great episode i can only think of the some of the likely similarities between Marcus Aurelius and Leon VI. 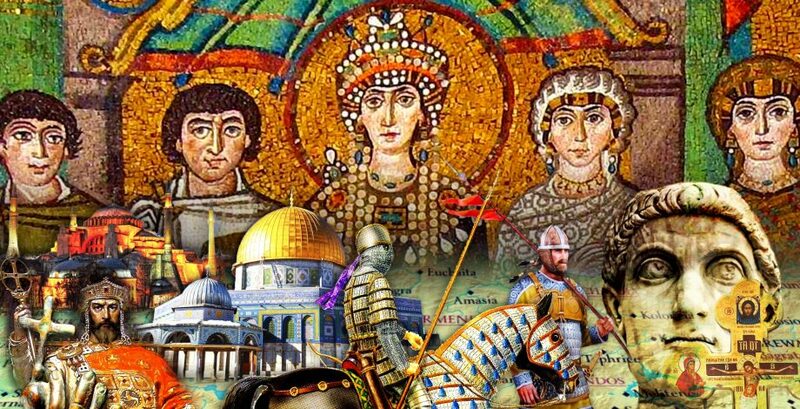 By now its pretty clear that Byzantine Empire was a very sophisticated state with a central government and bureaucracy for its time and despite the constant rebellions and civil wars was still able to function very well. Comparatively were there any states similar or close to Byzantium? As during this period the middle ages would be defined with the typical feudalistic kingdoms.